I bought the SL Ullr's chariot. as per Peters advise. it says in the manual that you should stone grind them before skiing them. I checked the base with a true bar and they are not high. the company also recommends that you put a 1.5 deg side bevel and a .7 base bevel. why? is it better I always do a 2 deg on side and 1 on the base. Re: Starting point for newbies. the sight Realskier is awesome! full of helpful info and reviews. 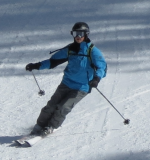 Does the PMTS aka harb ski method differ from PSIA? Moe...the factory spec's for tuning were specifically designed to maximize their performance. In all honesty....if you're using 1 and 2....probably not going to be noticeable unless you're skiing at the World Pro level. However, if you like the factory performance...might be worth picking up the new guides. I don't think you can get a true 1 and 2 without taking the edges back to 0 and filing to the desired bevel. Best way to do this is at a ski shop where they use their laser guided "big green machine" to reset the edges. Also, PSIA differs significantly tho PMTS. PMTS is excellent carve oriented technique. Precision Ski in Frisco was selected by SkiLogik to do the prep for the skis that SkiLogik was showing at the Ski Industry show in Denver. They were using .7 and 2.? Their thinking was that 1 and 2 is almost the same net angle, and while .7 might be too grabby for a narrow ski it helps the wider ski engage the edge. By the way, this same shop was recommended by Harb Ski Systems for those (like me) that don't tune their own skis. I had them do my Ullr's Chariots and was pleased. They also recommended grinding a bit of texture into the base. the manufacturer also recommends that one does a base grind before using the skis. whats your feeling about this? i always ski the ski first a little and then do it. i checked the bases with a true bar and they were pretty good. I'm shaking my head in disbelief that with a brand new ski, the manufacturer tells the customer the ski needs a base grind! Does not say much for the Quality Control in the shop. I know there are many who reported poor tunes from the manufacturer that required work, but, should the costs be borne by the customer?? My expectation from a shop would be that the ski has been preped for skiing by the selling shop to include a check with a true bar to ensure a flat base plus base wax etc. There are several on-line sites that include a basic prep with each ski. Am I out of touch with reality? Enjoy your new skis. The original tune is typical of a softer snow set-up. If I were to use them on harder snow, I would not hesitate to change to a 1 degree base and 2 degree side. I'm thinking that if in a blind test your skis were prepared with two different geometries, one edge at .7/1.5 and the other at 1/2, that few skiers could differentiate between the tunes. G, Why can't a .7 base be changed to 1 degree without a grind? Removing extra should be no problem. Going from 1 to .7 would require a grind. Just wanted to say that the "manual" that came with mine didn't have that suggestion. The fact that it said what the factory tune was is more than is readily available from most manufacturers. The reason I had mine checked was because the guy that did my bindings mis-measured; and because I normally do 1 and 3 degrees and was looking for advice. I was very pleased with Precision Ski, and they measured the ski at exactly what the factory said it was supposed to be. And i admit that I probably can't feel the difference between a 2 degree and 3 degree side bevel. now I got to buy a binding for this ski. the marker Jester is $340 and the Griffon is $240. the jester go's till 16 din and the griffon till 12 but my din setting is 10. is there any reason to spend the extra money on the Jester or is the Griffon good enough? Hey Mike...I think it can too..just it's going the other way that I think is the problem. Enjoy those rippin' skis Moe!